Delivery time: In stock, ready to be shipped! 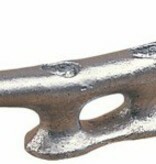 Our heavy-duty dock cleats are made from corrosion resistant hot dipped galvanized iron. Rugged construction makes them ideal for docks, piers and workboats. The large open base is designed to handle multiple dock lines and distribute heavy loads with ease. Cleats have recessed sockets for FH bolts. Fasteners sold separately.